The decorations used in the fall can really last for so many months with just a few changes. 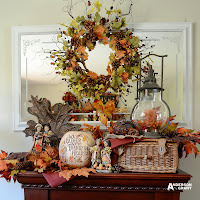 I decorated in September for the season, and while I didn't decorate for Halloween, much of what I used could have been updated for the holiday with the addition of a few jack-o-lanterns, witches, crows and cobwebs. 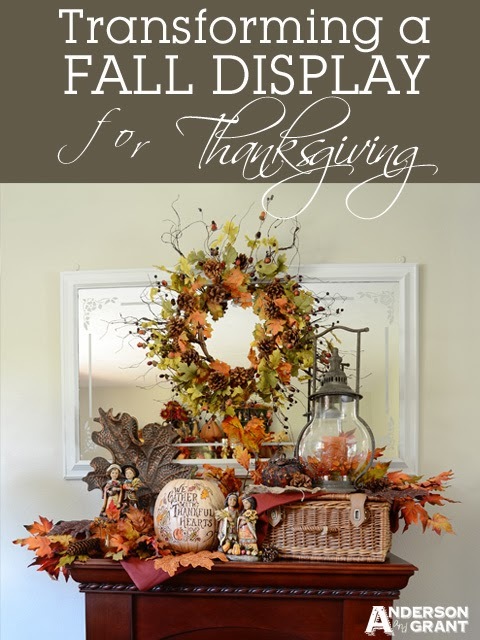 The same is true for Thanksgiving and I'd like to share with you how I took my fall mantel and turned it into a Thanksgiving showpiece! I don't think a lot of people decorate for Thanksgiving. Unfortunately, in both decorating and celebrating we pass from Halloween right on to Christmas. 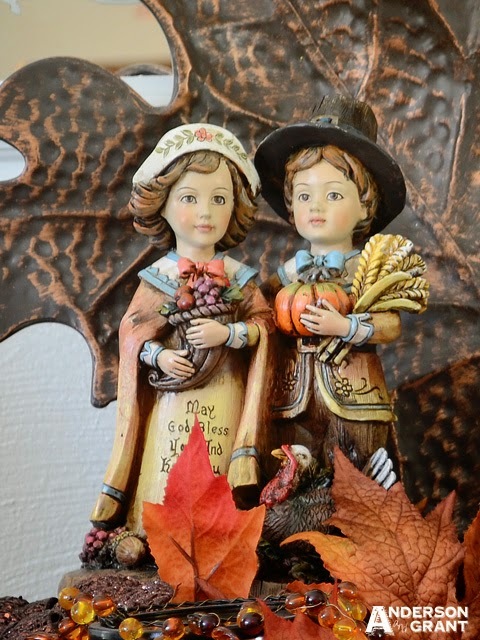 Partly, I think, because there really aren't a lot of great Thanksgiving decorations out there. I'm not a fan of cutesy stuff and that is really all that is easy to find. If you search hard enough, though, you'll find some great pieces. 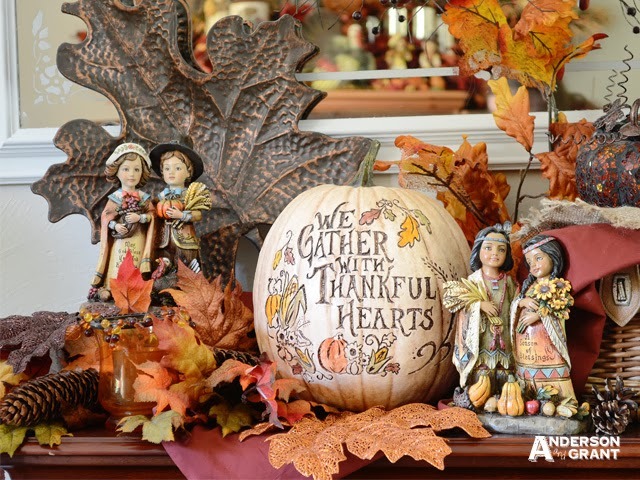 Hobby Lobby and Kirkland's both have great decor for Thanksgiving. 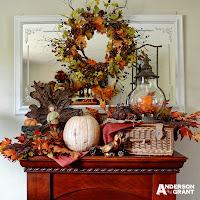 I must admit that I put the fall mantel together knowing that I wanted to be able to easily transform it for Thanksgiving. My blogger mind was working with you in mind! 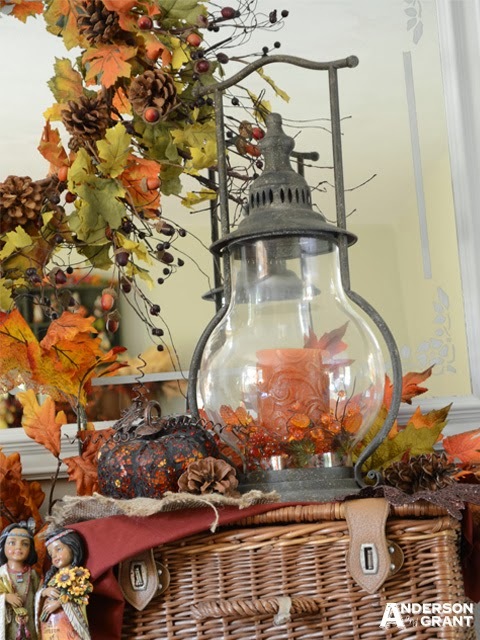 Some of the pieces I used in the fall, like the wicker basket, lantern, and wreath, I kept in the Thanksgiving display. 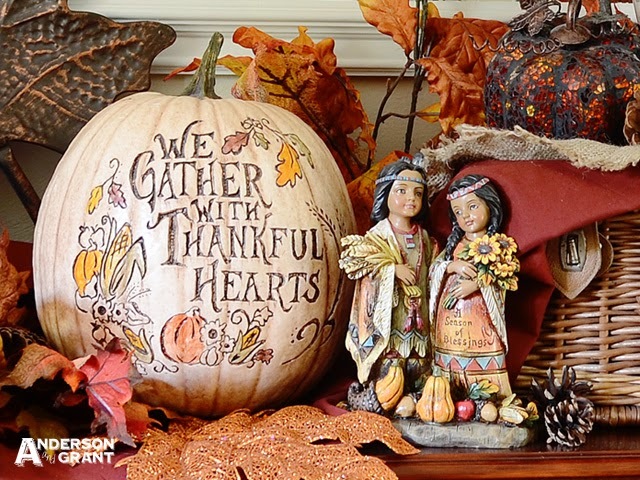 The brown bird and boy with the pumpkin in a wagon were replaced with Pilgrim and Native American figurines. And my favorite change....the pumpkin was turned around to reveal "We Gather Together with Thankful Hearts" which is etched into the pumpkin. 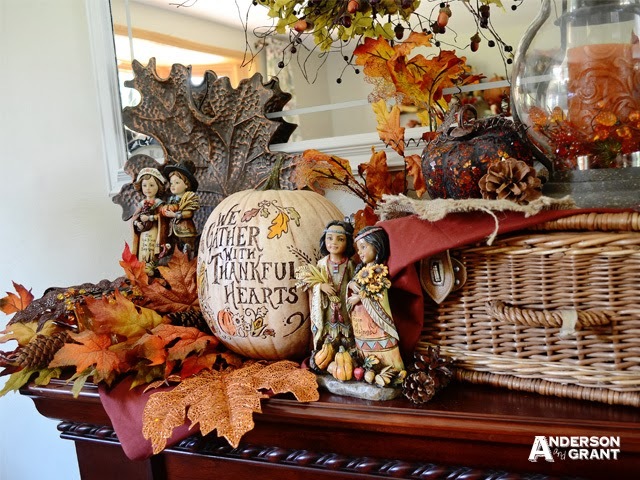 Hope this gives you some inspiration on how to include a little Thanksgiving into your decorating this month! My Fall Mantel or Thanksgiving Mantel?